Justice League: The Art of the Film review: Pretty and well made, but light on production details – AiPT! See behind the scenes photos and art designs of ‘Justice League: The Art of the Film’, out now! Justice League may not have made the money Warner Brothers was hoping for, but they certainly made a visually stunning film. Reportedly the film cost upwards of $150 million and you can tell due to the sharp special effects and polish on the final product. That is in large part due to the art design that went into it, which Titan Books has most graciously shown in their recent Art of the Film book. Inspired by Superman’s selfless act, Batman and Wonder Woman work quickly to find and recruit a team of metahumans – Aquaman, Cyborg, and The Flash – to save the planet from an assault of catastrophic proportions. 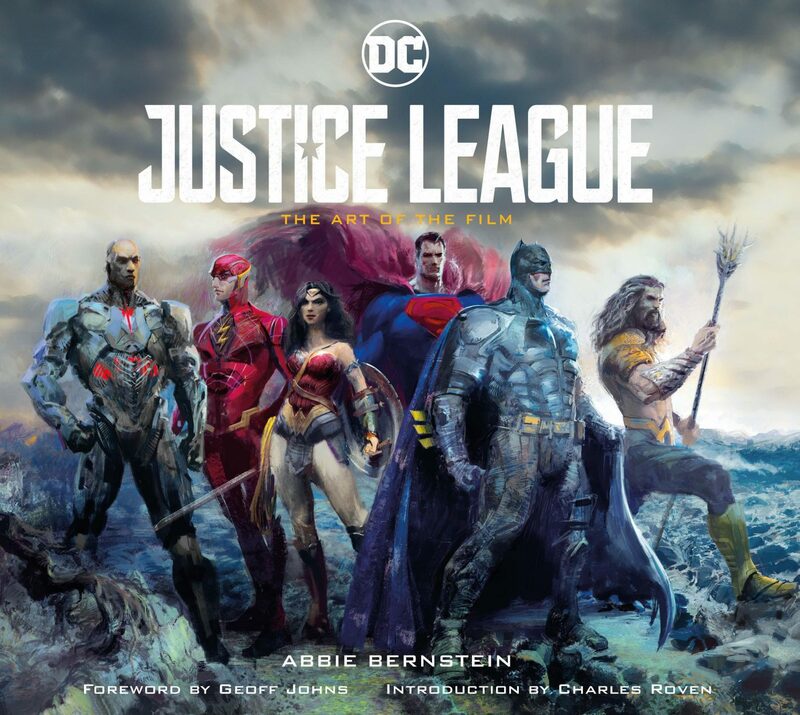 Packed with stunning concept art, sketches, costume detail, stills, and behind-the-scenes shots from the set, this book is an invaluable insight into the world of Justice League. If you’re at all interested in the art design that went into each costume, set, and vehicle, this is the book for you. If you dug the movie, this is also a cool way to experience it from different angles. It’s also got a foreword from DC Comics writer Geoff Johns and an introduction from producer Charles Roven to capture their point of view in creating this film. Plus, all of the actors chime in on the production throughout this book. More often than not art books don’t allow the actors of the film to chime in on the production, but this book does so and then some. Not all of their commentary is enlightening, but it’s nice to hear from them on specific aspects of the production. Some key takeaways are Henry Cavill’s view on where Superman is in this film and Jason Momoa’s excitement at playing Aquaman. I didn’t notice the skull gargoyles when I watched the film, which are prominently displayed in the book. The book is organized based on the flow of the film with a spotlight on the costumes for the characters about midway through the book. That makes sense since the team doesn’t form until about midway through the film. Costume designs are a highlight of this book, with information on how they changed Superman’s costume (brighter blue!) to why Flash’s costume looks the way it does. There are also some interesting details on the costumes of the characters that pop up in a key flashback in the film including old gods Ares and Zeus. That’s an excellent example of how this book can show you much more than the film does seeing as these characters are on screen for mere seconds. There’s also a great section on Themyscira and how the art team approached its appearance in the film differently since it’s a portion of the island we didn’t see in Wonder Woman. There’s also ever so slight visuals for scenes that weren’t in the film, like early concept art of Batman taking control of a Parademon cannon, and a scene involving Cyborg’s dad. The art in this book is quite nice and varied. There’s a heavy use of photography early on in this book, with computer-created paintings of environments and costumes thrown in too. An occasional sketch will pop in as well and on-set photography here and there. Overall it’s a good mix. The intro and foreword by Johns are quite good and it gave me a strong sense of what they were going for with the production. It may not be a perfect movie, but I respect Johns’ point of view on heroes and their worth in this world at a time when Superman is dead. The art of Atlantis is gorgeous, though slim with only a couple pages in this book devoted to that. When production folks chime in it’s great, but it’s a rarity here. Most pages have a description of what you’re seeing and not much more. Zack Snyder only chimes in once or twice for instance, and if you are expecting a thing from Joss Whedon you’ve come to the wrong place as he doesn’t contribute at all. It’s nice to see the actors get quotes here for sure, but most of their quotes are a bit empty with little value to them. The quotes are so few (maybe a quote every five pages) and short you’ll breeze through this book in no time. It’s rare when this book pulls you in closer to the production. It’s more of an overview of the entire process, as if you’re watching it be made through a window rather than sitting at a table and hearing how and why decisions were made. Take for instance imagery of Steppenwolf in a later section of the film. The art seems to suggest there was a much darker, almost horror-like vibe from the design that ended up getting brighter and less scary looking. That’s an element that you’ll have to continue to wonder about since there are barely any details in this section of the book. That makes this a fine coffee table book for its images, but if you are expecting a better understanding of the production this will leave you wanting. This is a well made book with a lot of cool images. It also has insights into the production, but unfortunately it’s light on this material and instead may best serve readers who want a book of pretty pictures, rather than a deeply insightful look at the production of Justice League. I’d recommend this to anyone who was a big fan of the film, but movie buffs will want more. I enjoyed flipping through this book, especially since it offers some details into production, but I was left wanting more.